I remember the exact moment I began to care about writing. It was 2009 and the Lakers had just won the NBA championship. Right after the game, I read a fascinating ESPN.com article on Kobe Bryant from a writer named Bill Simmons. With its entertaining tone and fan perspective, it was wholly unique to any sportswriting I had seen before. I was just about to start college, didn’t consider myself a writer, and didn’t have much interest in the subject at all. The next two years I followed Simmons religiously. Sure, he was an obnoxious Boston fan most of the time, but he was a fun, relatable, and engaging obnoxious Boston fan. When it was announced that ESPN was opening up a Simmons-run site with 70% sports/30% pop culture content, I would say I was cautiously thrilled, if you can be such a thing. It sounded right up my alley, but an entire website of Simmons imitators made me a bit worried. Don’t get me wrong: I love Simmons’ writing, but a whole site of 4,000-word retro diaries and shaky sports-pop culture analogies supplemented by heavy doses of unabashed homerism? That didn’t sound so super. Now, four-plus years later, my favorite site has shut down. Boy, did they. This was a site where you could read a deep-dive into how LaMarcus Aldridge will fit in with the Spurs right next to a “Definitive Ranking” of all the jackets in Star Wars. The smartest thing Simmons ever did was hire a bunch of people who don’t write like he does. Whatever you think of him as a personality or as a writer, the guy knows how to find talent. Unsurprisingly, the collective nature of the enterprise was one of the things that will stand out the most in Grantland’s legacy. When several insanely skilled writers all jumped on one blog post — like in their NBA Shootarounds, the Lightning Round takes after a new album or movie trailer release, or the After-Party group posts the morning following the Emmys, Oscars, etc. — it was unlike anything you could find on the Internet. That was some of Grantland’s best stuff… except for a Brian Phillips piece on Federer, FIFA, Messi, sumo wrestling, shark attacks, sunken WWII battleships, and well, just about anything. For me, Phillips was the Danny Ocean of the group, the guy whose effortless brilliance seemed to consistently outshine everyone else. His longform work, where he gifted readers with poetic, transcendent, astonishing, and deeply weird pieces on Japan (The Sea of Crises) and the Iditarod, are perhaps my two favorite things to ever go up on Grantland. That’s not to say the others couldn’t bring it. Andy Greenwald is the most clever and infectious TV writer I’ve read. Alex Pappademas came with fresh, intelligent perspectives on Hollywood, and film in general. Zach Lowe gave us exhaustive and insightful NBA coverage. Bill Barnwell and Robert Mays did the same on the NFL. Molly Lambert wrote in a number of different areas, but I’ll remember her witty and incisive celebrity profiles, as well as her extraordinarily perceptive Mad Men recaps, the most. Steven Hyden arrived more recently than the others, but the former Pitchfork contributor wrote knowledgeably and entertainingly on all things music, past and present. Rembert Browne brought that uncanny ability to merge the endearingly silly with the seriously journalistic, often in the same article. And Chris Ryan could seamlessly transition between the NBA, Premier League soccer, and film/TV analysis with aplomb. Those are just my personal favorites. There’s countless other writers/editors whose work I thoroughly enjoyed. 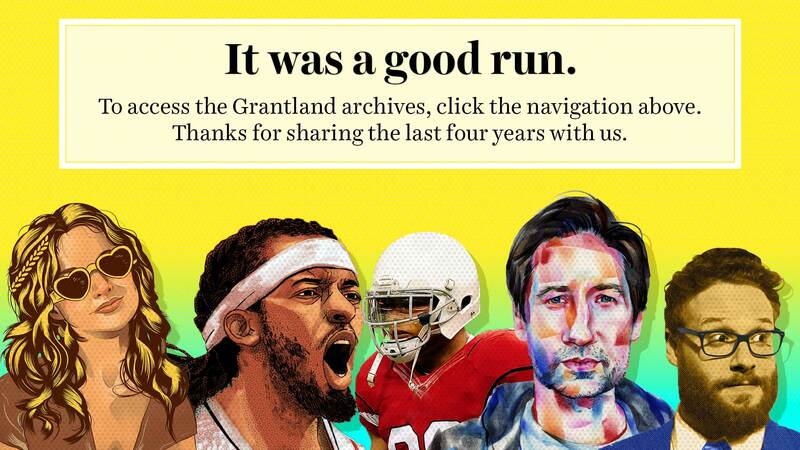 If you read Grantland daily, you were left astounded by the vast array of style. The other best thing Simmons did besides hiring writers that were unlike him? He allowed them to “do their thing” by straying across subject lines. On the same day, you could find a writer penning an essay on the latest Netflix show and appearing on a group NBA post. I don’t know of any other publication where this happens. Grantland had a deep understanding that people who write well in one area can probably write well in another. There was this unpretentious combination of high and lowbrow that they pulled of so well. For example, they somehow put together a Paul Thomas Anderson Week and a Rom-Com Week. The engaging reader-voted brackets to decide the Best Tom Cruise or the greatest character from The Wire were acknowledged as the meaningless, yet highly amusing, content that they were. Then there was Oscarmetrics, the hilariously absurd Mad Men Power Rankings, and the NBA Playoffs and March Madness coverage that made those events even more fun to follow. Of course, Grantland’s podcast network can’t go unmentioned. Any subject you wanted covered had a podcast that irreverently discussed the latest news. The rapport between hosts was obvious, probably because many of them were already familiar before they became Grantland coworkers. After a few listens to the Hollywood Prospectus or Girls in Hoodies, you felt like you were in on the jokes and a part of the circle. Time seems to fly by when you look back at a specific moment, like that first Simmons article I read six years ago. Then you realize just how much has happened in that elapsed time. I went from a holding an utter indifference to developing a serious love of writing. Now this blog exists. Now I write about soccer for a living. Now I know writing about sports and pop culture will be something I’ll likely do for the rest of my life. I’d say pretty confidently Grantland was the primary driving force behind this evolution. For the last couple years, my dream job was to write for that site. What led to Grantland’s death was a mix of corporate politics, a post-Simmons lack of leadership, and its refusal to bend to the substance-free clickbait online culture to drive traffic. In the many eulogies across the web, you got the sense that Grantland’s influence had a wider reach than anybody thought. Its loss will be felt, but the talent is still out there to create something similar in the future — although its brilliance will be tough to match. We got four-plus years of thought-provoking, entertaining as hell, and routinely exceptional words on sports and culture. I call this a bittersweet salute because I’m embittered and dejected seeing Grantland die. Still, I’m sentimental and grateful I ever saw it live.